“The skill I learned from the massage training will help me find extra income for my family”, claimed one of the graduates during the Iyashi (Therapy) no Chikara Project’s graduation ceremony. 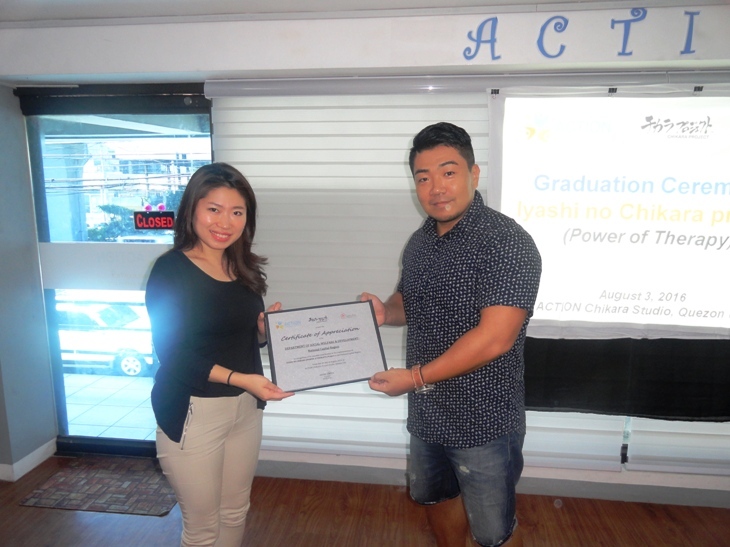 On August 3, 2016, Iyashi no Chikara held its first graduation ceremony for the beneficiaries of the project in Quezon city. Nine individuals (1 male, 8 females) who have successfully completed the 3 month training course on Swedish and Shiatsu massage were recognized and awarded certificates of completion. Mr. Yokota, the founder of ACTION, opened the event with his welcome message, where he explained the reason for offering massage therapy trainings in the biggest city in the National Capital Region. He said that he saw the potential of massage therapy as a way to address poverty conditions resulting from insufficient income. He further said that having skills in massage therapy is essential, especially in Metro Manila where there are hundreds if not thousands of massage spas that may offer employment opportunities for the graduates later on. The major sponsor of this project, REJOB, a human resource agency for beauty and wellness in Japan, was represented in this event by its project coordinator Ms. Miho Ueda and other staff namely Ms. Masako Fukuhara and Ms. Natsumi Yoshida. Ms. Ueda also shared a message of solidarity and support to continuously assist individuals in the Philippines to find other sources of income through massage therapy. Three beneficiaries of this project were able to share their insights and significant learning during their testimonials. They also shared their plans right after graduation – that is to offer home based massage services in their communities starting with their friends and neighbors. Thus, to assist the graduates in their new undertaking, ACTION provided a massage starter kit to each graduate. The Department of Social Welfare and Development (DSWD) Regional Coordinator for Pantawid Pamilya Program, Mr. Joel Cam, accompanied by Ms. April Co, Institutional Partnership Development Officer and Ms. Raquel Avecilla, Pantawid Area Coordinator, were also present to witness this milestone accomplishment. 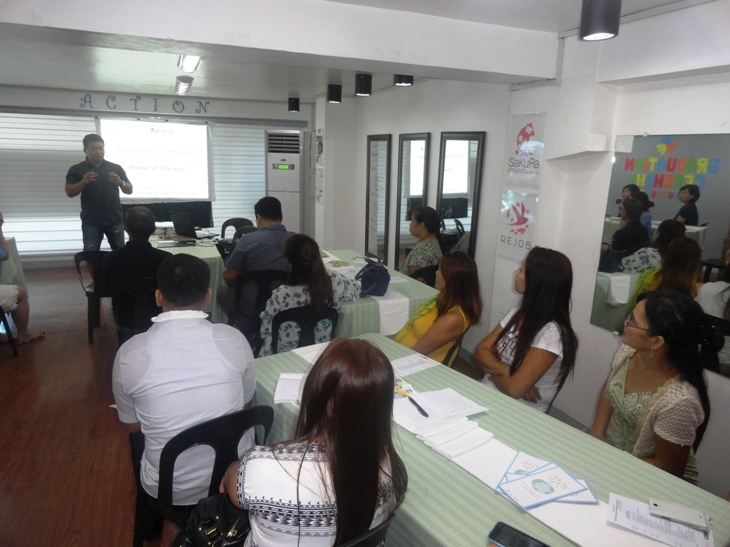 Mr. Cam, on behalf of the DSWD expressed his gratefulness to ACTION for the training provided to the beneficiaries of Pantawid Pamilya Program. He shared that the government welcomes any assistance being offered by non-government organizations to help augment the services that the DSWD is already providing to needy individuals. Before the event ended, the graduates were able to demonstrate the valuable skills they learned on massage to all the guests of this event. 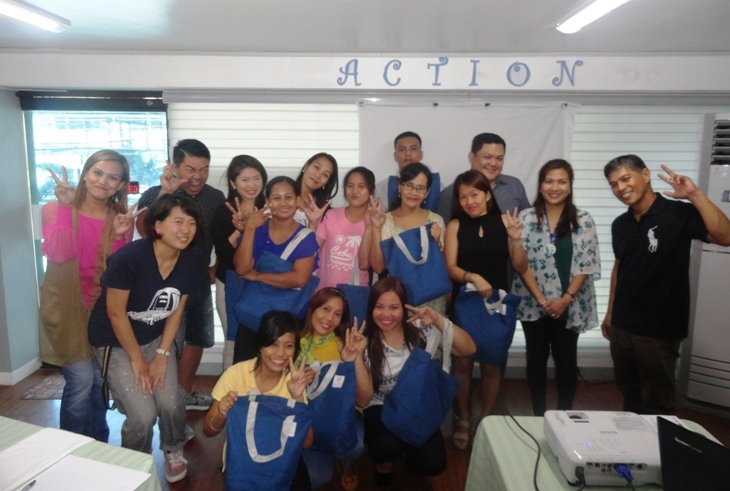 ACTION’s Iyashi no Chikara Project in Quezon city started in April this year. The project aims to contribute in on-going efforts to address poverty conditions, by offering free massage therapy trainings as an additional means of income for impoverished individuals. The next batch of massage training will begin this September, open to any interested individuals, between 16-45 years old, as long as they are low-income, and can commit to a 3-month training program.